HOW MUCH POWER SHOULD MY SOLAR SYSTEM BE PRODUCING? When monitoring your inverter, it can be useful to know what some expected readings might be so you know if your system is functioning as well as it should be. To do this you’ll need to know how much solar (in Watts [W] or kilowatts [kW]) you have installed on your roof – otherwise known as your solar array size. Instantaneous Power in Watts or Kilowatts is often one of the main displays shown on your solar PV inverter. This, as suggested is the power that the system is producing this instant. This figure is great to understand when best to power on appliances around the house to take advantage of the available power. Daily Output Power in Kilowatt hours (kWh). This is a running total of how much power has been produced that day and can be used to compare with your power consumption as noted on your power bill. First we should look at what the available “average sunlight” should do for a solar system. This graph shows the expected output on an average day for a north facing, unshaded solar panel system. While this is a fairly broad generalisation, it is fairly typical of what you could expect to see at an initial glance what a solar system might produce. For instance, on an average sunny day at 10am in summer an average 5kW solar system would likely be producing up towards 3.5 to 4kW but in winter you might only expect between 2 and 3kW. Cloud cover also has a fairly drastic effect on the output of solar panels. It is very likely that in very cloudy times a 5kW solar system could produce less than 1kW. If you like the look of these graphs, check out our blog on Monitoring Options. Most brands of solar PV inverter will give you a display of Daily kWh or Energy Today or something similar. Consult your inverter manual if necessary. This is the amount of power generated by your system since it started in the morning. There are again many factors to take into account to accurately predict how much power your solar system should make each day. But there is also a VERY simple formula to give you a rough idea. Yes, that’s it! So a 5kW solar system should on average produce around 20kWh per day. 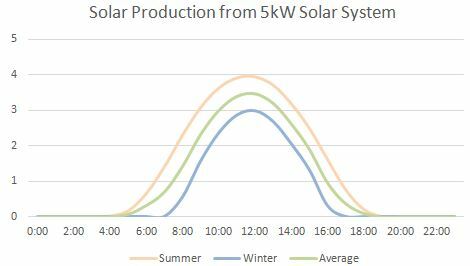 You will likely see much more power produced during great solar days in summer, probably up to 30kWh and much less power produced during a cloudy winter day maybe lower than 10kWh. But over the year it should average out to around 20kWh. You don’t need to be out there with a pen writing all this down, but if you would like to do an occasional check just before dark, check the daily total. Divide by 4 and you should have a number pretty close to the size of your solar array. If you feel that your system is performing poorly, the next step would be to consider cleaning your solar panels. If that doesn’t fix the issue, it would be a good idea to give your solar installer a call to discuss what else can be done. See our article on how to tell if your system is working correctly.